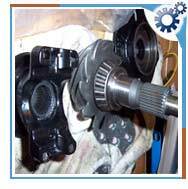 Hypoid gear drive consists of a pair of separately generated wheels, the larger one is called gear and the smaller one, pinion. Gear and pinion are installed in a gearbox. The thru-shafts of the hypoid gear drive units are supported at the forward end by tapered roller bearings in a cage and at the rear end by a ball bearing. Pinion bearing pre-load is adjusted and maintained by a hardened precision spacer between the inner and outer tapered bearings which are held in place on the pinion journal by large nuts. Yokes and flanges are held in place on the thru-shaft by separate thru-shaft nuts.